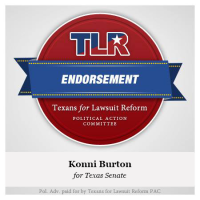 Today one of the largest business groups in Texas endorsed our campaign, Texans for Lawsuit Reform. TLR’s endorsement comes on the heels of a wave of local support, adding to the huge amount of grassroots leaders, elected officials and Tarrant county residents who strongly support our race for Senate District 10. Konni commented on the endorsement saying, “Our campaign couldn’t be more excited as we enter the last month of the runoff election with such a strong base of support from across the state and especially Tarrant County. I’m grateful for the support of Texans for Lawsuit Reform and the work they do to keep the Texas economy resilient and growing. I look forward to their support as we work to secure the GOP nomination, and as we move to take back SD 10 this November.